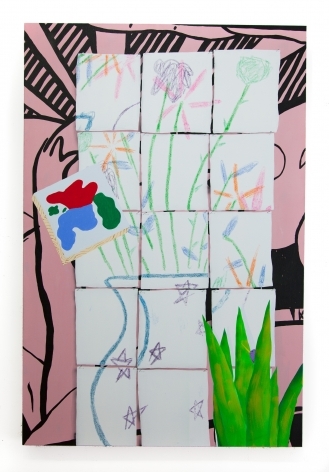 Miranda Kuo Gallery is pleased to announce Allot a Lot, Dan Fig’s debut solo effort in New York City. The body of work, made up of nine paintings, depicts a single narrative that spans several invented scenes. A collage-like sensibility, as well as nods to still life, brings together canvases that flitter between the static and the active. A single, nameless bird spins, sprints, forages, and flies its way through each scene, playing the role of a lingua franca; a personification of the tying together of disparate, cultural elements encountered while travelling. 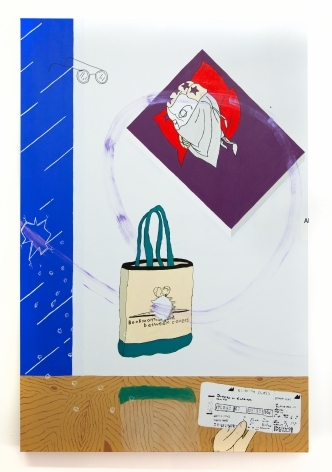 The paintings piece together a fragmented logic derived from observation, a reflection of the organically occurring still lifes we see around this city, that city, and wherever we may be. This rooting in reality points all the more to the absurdity of navigating contemporary life, though with a positive takeaway- the paintings are grateful homages to the incongruous. 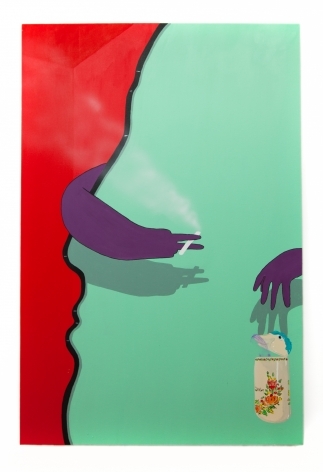 Mining a Pop Art palette and sensibility, the works marry several different ideas in a single plane each with its own set of visual indicators. A beer stein, a decorative ceramic mug brought to the U.S. by the Pennsylvania Dutch, wiggles its way into a strange narrative suggestive of a boozy hug and self love (or love of the other?) much as the mug itself shifted its own cultural narrative. 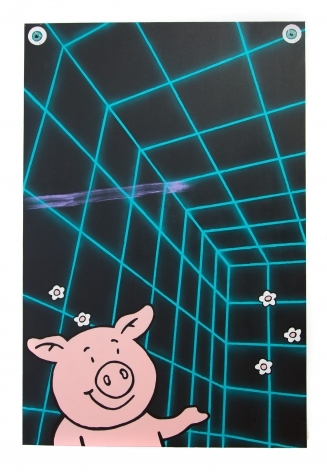 An anthropomorphic British pig presents the viewer with a Tron-like room and the assertion that he, too, though a contradiction in and of himself, can engage with contemporary art in a meaningful way. Allot a Lot, from language, to content, to form embodies a lyrical whimsy and asserts itself in paintings that are both accessible and convoluted. The seemingly simple proves itself to have myriad connotations and a mire of history, embracing the abstruse and the absurd with colorful exploration. 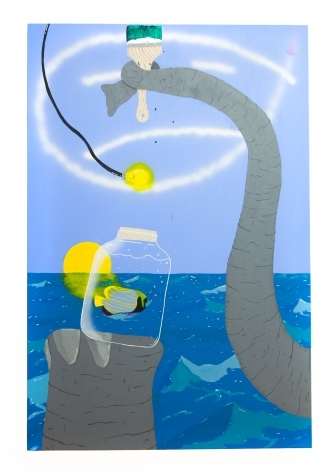 Dan Fig (b.1987, NJ) earned his BFA from Rutgers University in 2010 and is a current MFA candidate at Hunter College. 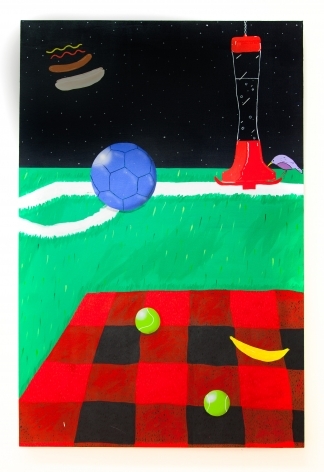 His paintings are amalgamations of cultural influences ranging from explicit art historical references, graphic design and advertising language, soccer matches, and more. These elements, in concert with one another and in their invented spaces, create a familiarity with a tendency toward the absurd. Dan Fig was recently an artist-in-residence at Treignac Projet in southwestern France.